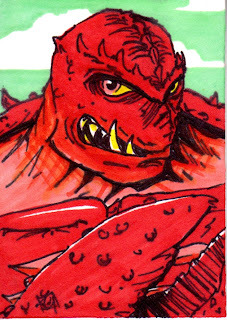 Taylor's Sweet Little Art and Nerd Site: Sketch Card of the day- Clawful! Today's deviation is Clawful. Oh Clawful, how rather silly you can be. Poor, poor, Clawful. He has been portrayed a a pathetic dimwit for so long, I'm not sure I could think of him as a cruel crab warrior any more, like I did as a child. Which is sad considering that his 200X design makes him look like a truly gruesome battling brute! Speaking of that 200X design, this card is based on his appearance in that line. Why? (You ask the best questions, oh great reader!) Well, I don't like black bushy eyebrows on my fishy mutant creations. it worked back in the early 80's on the vintage toy, but is sure doesn't work now on the classics version. 200X is the only design this character should have. You can also see this sketch card here.